Jenks Dance Academy specializes in beginners! Whether your child is interested in Ballet, Tap, Jazz, Hip Hop, Tumbling or Musical Theatre, we have the class for YOU! Leap, sing, twirl, and jump for joy in our classrooms! A 30-minute introductory dance class containing ballet and creative movement. Young dancers will learn the basic steps and learn how to follow direction and imitate movement in a positive environment. 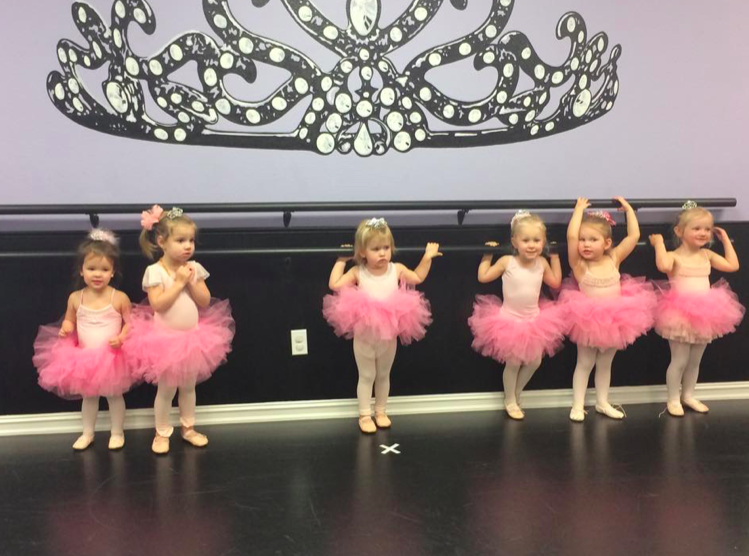 Engaging music is used to get these little dancers inspired. The use of props such as teddy bears, hula-hoops, scarves and maracas, enables the young dancers to use their imagination, creativity and, most of all, have fun! Attire: Pink leotard, pink ballet tights, pink ballet shoes, no tutus. A 30-minute tumbling class, introducing basic skills such as; forward rolls, balance beam, bridges, stretching, etc. Attire: Gymnastics or dance leotard or biketard, t-shirts for boys, shorts, bare feet. *Registration requires payment of the first month’s tuition and a $25 annual Enrollment Fee. Teaches basic tumbling concepts such as forward rolls, backbends, cartwheels, etc. and focuses on building strength and flexibility to prepare students for more advanced tumbling techniques. Attire: Gymnastics or dance leotard or biketard, t-shirts for boys, shorts, bare feet. * Registration requires payment of the first month’s tuition and a $25 annual Enrollment Fee. The purpose of this combination class is to introduce young dancers to several styles of dance, which help keep children excited, interested, and focused for the entire 60-minute period. Students will learn basic steps and terminology in all three styles. The use of fun, age appropriate music engages the young dancer’s minds and bodies. The use of props such as teddy bears and scarves for “freeze dance” make class the most fun! Attire: Pink leotard, pink footed ballet tights, pink ballet shoes, dance skirt (attached or pull on), no tutus, and black tap shoes with elastic (no ribbons). Cheerleading and gymnastics, basic to advanced skills. Instruction will consist of gymnastics and cheerleading motions and skilled technique combined with rhythmic movements to music. Individuals will also work at his/her level of ability on gymnastic elements including but not limited to: cart wheels, round offs, back walkovers, back handsprings, round off back handsprings, cheerleading jumps, etc. Students will learn how to show personality and showmanship. This class will build confidence in each student and will provide the skills needed for advancement in Cheerleading. Attire: Fitted top, shorts, tennis shoes. Future Disney Pop Stars! This FUN musical theatre style class focuses on dance, such as jazz technique and combinations, plus voice and acting with an emphasis on confident, outward expression of personality and attitude. Attire: Dance tank, fitted tee or leotard, black jazz pants, capris or dance shorts, tan jazz shoes.